Xiamen Airlines will enhance air links with economies participating in the China-led Belt and Road Initiative, its chairman said. Xiamen Airlines will enhance air links with economies participating in the China-led Belt and Road Initiative and turn Fujian province into a strategic point on the 21st Century Maritime Silk Road, which is part of the initiative, its chairman said. 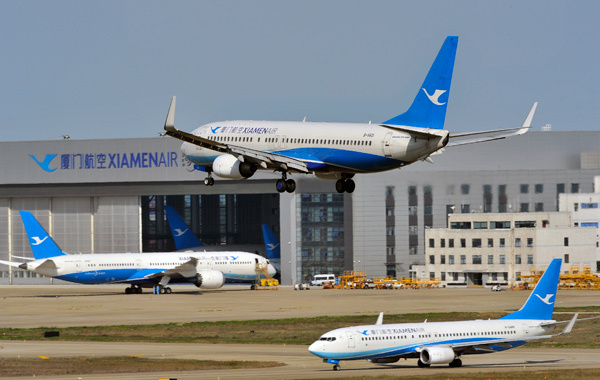 "The five years that followed the 18th National Congress of the Communist Party of China (in 2012) were the golden period for Xiamen Airlines," said Che Shanglun. "And in the next five years, we will focus more on the connectivity between Fujian and the economies involved in the 21st Century Maritime Silk Road." Founded in 1984, Xiamen Airlines is China's first civil aviation company to be run like a modern corporation. By 2010, the company's registered capital soared from 1.2 billion yuan ($182 million) to 5 billion yuan in three years; and its entire assets were valued at over 30 billion yuan. In 2012, Xiamen Airlines officially joined SkyTeam, an airline alliance of 20 different flight operators across the world. Global connectivity to 1,024 destinations in 178 countries and regions ensued. "In the five years after 2012, Xiamen Airlines grew rapidly in both size and business volume," said Che. "The number of aircraft increased from 86 to 200 and the number of passenger trips made through Xiamen Airlines rose from 17 million to 30 million a year. It was like we created another Xiamen Airlines within five years. "The airline is the epitome of China's surging civil aviation amid the country's reform and opening-up," he said. The company plans to have 15 wide-body aircraft at the end of 13th Five-Year Plan (2016-20) and invest more on the connectivity with economies involved in the Belt and Road Initiative. "We will spare no effort in expanding our business in Hong Kong, Macao, Taiwan, Southeast Asia, Northeast Asia, Europe, the United States and Australia," Che said. In May, the company announced the launch of a direct flight from Fuzhou to Paris from December. "The Xiamen Special Economic Zone is part of the reason behind the successful internationalization of Xiamen Airlines," said Lin Zhijie, an aviation industry analyst and columnist at carnoc.com, one of China's biggest civil aviation websites. "There are a large number of Xiamen business operators going abroad, thus the local economy is very much export-oriented with a close connection with the rest of the world," he said. "It has also posed bigger challenges for airlines to be more international." In the past three years, Xiamen Airlines has started 10 routes connecting different continents. It was a significant step to further open the city to the world, Lin said. Xiamen Airlines plans to have 560 aircraft in its fleet by 2035, making it one of the most competitive flight operators in the world, according to Che.